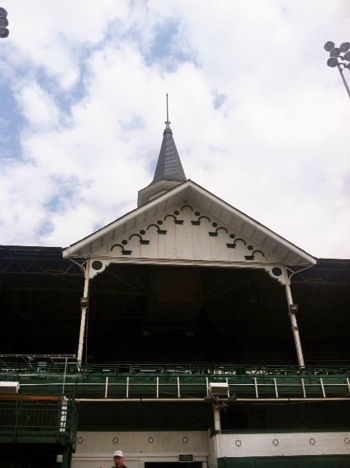 Churchill Downs – Where Did Mary Go? 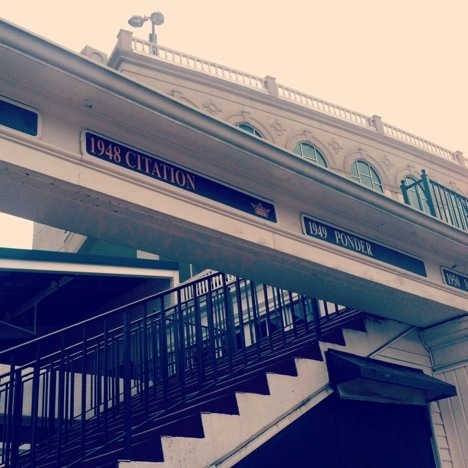 When you visit Louisville, you must go to Churchill Downs. Plain and simple. It does not matter what day of the week or time of year it happens to be. Although the timing of my visit was ideal because Derby weekend was only three weeks away, and serious preparations were in full swing. 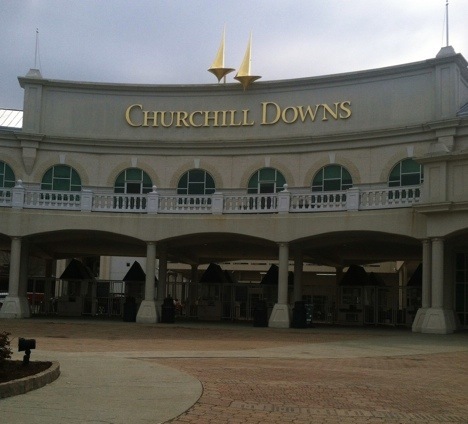 Of course I am talking about the Kentucky Derby, for which Churchill Downs is most famous. Too bad I wasn’t heading to the actual race, because I found a $5 bill in the grass as we sat at a stoplight on our way to the Downs. I am keeping that bill with me as a little piece of luck, but who knows what it could have turned into had I placed a bet with it! I must disclose that I know next to nothing about horse racing or the Kentucky Derby itself. I am skeptical about sport that involves animals because I wonder if they are being mistreated or exploited. However, I do respect and appreciate the tradition of a race that has existed for 140 years, so I entered the grounds with an open yet cynical mind. I began briefly wandering through the Derby Museum conveniently located at the Downs. 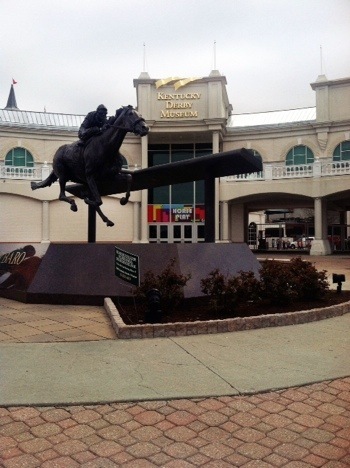 Famous past Derby outfits and various artifacts are on display for visitors. I was then ushered into a small oval auditorium where I watched a video about the Derby, complete with interviews of trainers, jockeys, and historic photos & video. The only thing left was to take a narrated thirty minute walking tour of the grounds, included in the museum admission fee ((there are also several other tours available for additional fees)). The first thing I noticed as the group set out on the tour was plaques along the building facade with the year and winning horse’s name for every single one of the past 139 Derby races. Our guide told us it is tradition to know which horse won the year of your birth – mine being ‘Gato del Sol,’ and guess what? He and I were born on the same day, the 23rd of February! He was born three years before me, as all horses that run the Derby are three years old. Derby Horses are primarily stallions ((male)), although thirty-eight fillies ((female)) have competed and three have even won the race. As previously mentioned, the thoroughbreds all race at three years of age, being retired from racing after the final race of the year, usually the Belmont Stakes in Queens, New York. The most successful of race horses are then used for breeding purposes, which is actually where the majority of money is made. Horses that come from desirable, or good, family lines can be grossly lucrative. During Derby weekend, the amount of people entering the turnstiles and grounds reaches around 175,000! That is close to three times the amount of people who attend the Super Bowl each year. Partner that statistic with the fact that cash is the only form of payment accepted for placing race bets, and you can imagine the amount of cash that changes hands each year at the Derby. 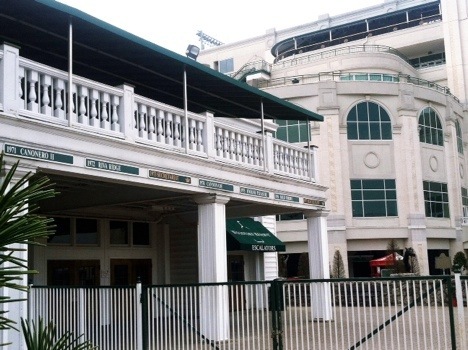 Horse racing was brought to Louisville by the grandson of William Lewis of THE Lewis and Clark, Meriwether Lewis Clark, Jr. He visited England in 1872 and witnessed the Epsom Derby before returning to the States to form the Louisville Jockey Club in order to raise money for the building of what would become Churchill Downs. You may already know that Secretariat holds the mile-and-a-quarter race record at 1:59:04; a record that has held since 1973. Some other traditions of the race are of course the fancy Derby hats, mint juleps, red roses, and the University of Louisville marching band playing My Old Kentucky Home before each race. 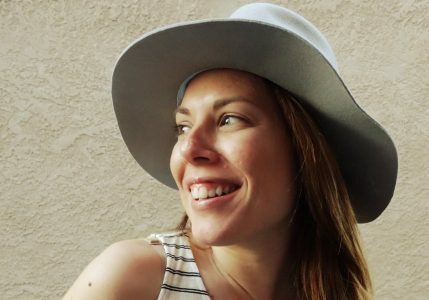 Gorgeous homemade Derby hats and headbands can be found all over the city as well as in the Museum gift shop. 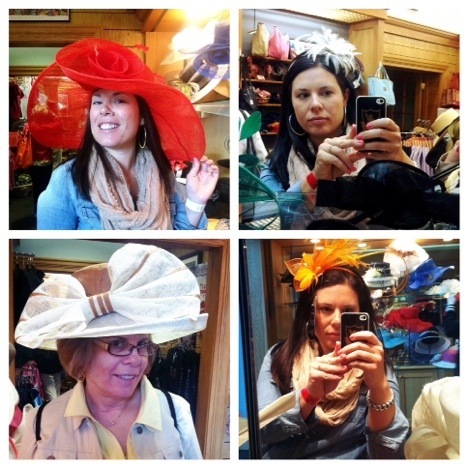 Of course I had no choice but to try on a few hats and fascinators! Truthfully, I still left the Downs with some skepticism, as there is little to no mention of the treatment of the horses and their rehabilitation after age 3. I think that happens a lot at museums and in history books – glorification instead of the entire harsh truth of the story. However, I did leave with more appreciation for the race itself and the integral part of rich tradition it holds for Louisville and all of Kentucky. It is a venue that can tell quite a story. I would like to attend Derby weekend someday. 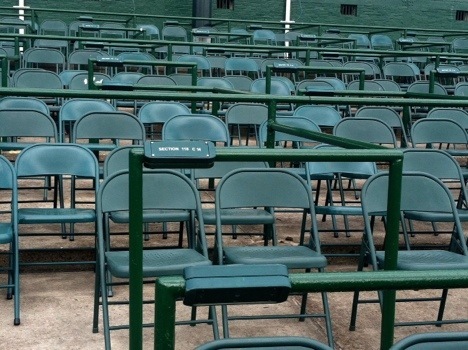 I doubt I would ever pay the ridiculous amount to have an actual seat, but I could splurge on the $50 entrance fee to get into the gates and experience the fascination and excitement firsthand. 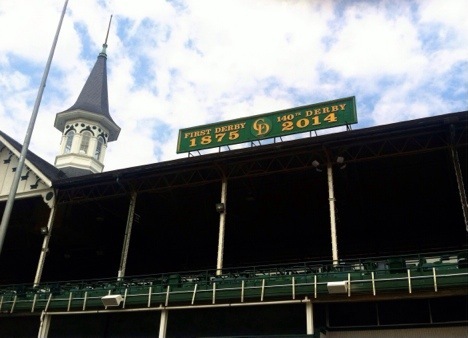 This year’s Kentucky Derby weekend and big race is now only one week away! Keeping with tradition, it will be held the first weekend in May, with the Derby occuring on Saturday the 3rd. That means there may be just enough time left to plan your Derby party! 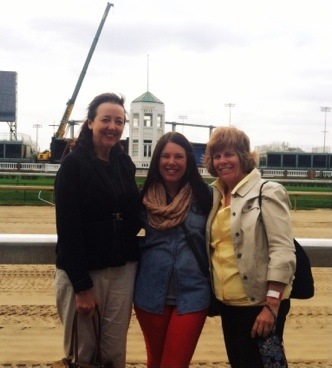 Thanks, again, to Jeanne for being such a great host in Louisville and for taking my mom and I to Churchill Downs. One day we will take you up on your Derby weekend offer! 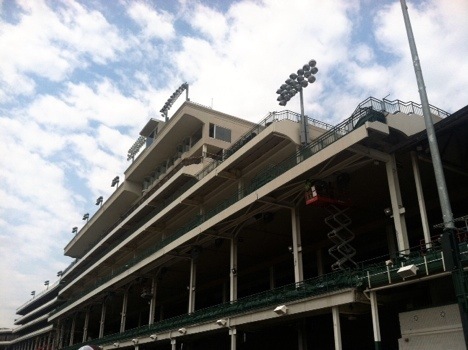 Have you ever been to the Kentucky Derby or Churchill Downs? Love your recap of the history, rich in tradition! Isn’t it incredible the cash only part, for placing bets?